What better way to celebrate five years of microcanning than by releasing really big cans? That’s not exactly what the folks at Oskar Blues in Lyons, Colo., are doing, but it sort of looks like that doesn’t it? Now the mini-kegs are getting a little bigger. The brewery is rolling out 5-liter/1.3 gallon mini kegs. 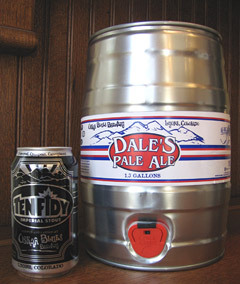 Keg cans (with built-in taps) Dale’s Pale Ale will reach select stores along the Front Range starting Dec. 3. They will retail for around $24. Visitors to the Oskar Blues pub in Lyons can buy these cans filled with Dale’s Pale Ale, as well as Old Chub Scottish Style Ale, Gordon, Ten FIDY and the brewpub’s other-in-house beers. These cans have replaced the traditional glass growler at Oskar Blues. The brewery has also added its Ten FIDY Imperial Stout (the name is an allusion to motor oil and the dark luscious color of the 9.4% abv beer) to its can lineup. The suggested price for a four-pack is $12.99. Since selling its first can of Dales Pale Ale in November of 2002, and being followed by scores of other craft breweries selling beer in cans, Oskar Blues has grown twenty-fold. The brewery sold 700 barrels the year before installing its first table-top, two-cans-at-once filler, and this year will ship 14,000 barrels.